the area’s pleasant towns and villages attractive place names to attract people from other parts of the country. Examples are such as Summerland and Peachland – both offer an enduring image of idyllic destinations with the accent on nature’s beauty. Another such place was the quaintly named Cherryville and it’s to this area we were drawn on two occasions during the past week. 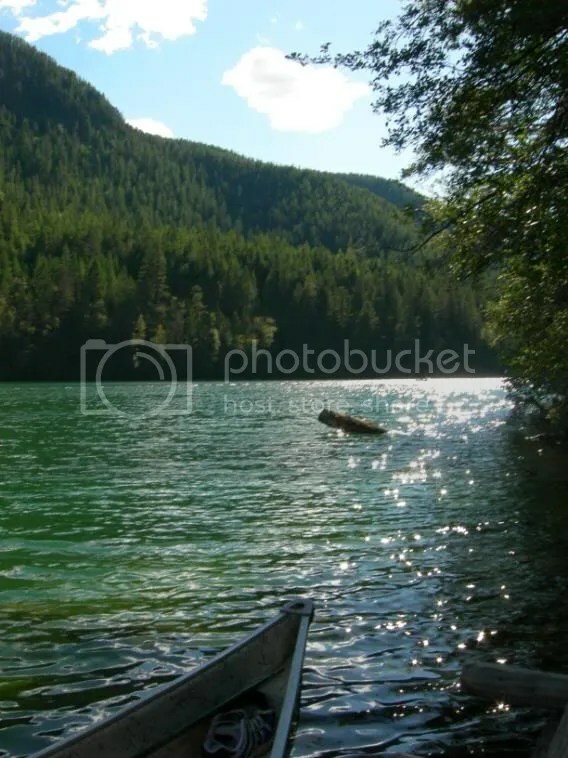 Specifically to visit friends at a camp site situated in Echo Lake Provincial Park. Cherryville was originally a gold mining camp way back in the 1860s’ and was at that time populated by a hundred people, many of them Chinese miners. The area got it’s name from the wild Choke Cherries that grew along the banks of the local creek. Overshadowed by the spectacular Monashee Mountains, Echo Lake gains it’s name from the echo provided across the water from standing in the foothills of these mighty hills. Driving north from Kelowna and past the now familiar Kalamalka Lake, we hit the small city of Vernon and turned right to the small community of Lumby before heading off down a gravel road which saw our little Mitsubishi skittering about the unmade surface, churning up a dust storm to match the one created by the pick-up truck being tenuously steered in front of us.